Lavender is a shrub-like perennial. Used in beds, borders and edges, the light purple flowers and blueish green foliage add color to your garden. Lavender varieties range in size from 10 inches tall to more than 3 feet. While it's possible to grow lavender from seed, it is most often grown from potted plants or bare root plants. Bare root lavender is in a dormant state. There is little foliage and a cluster of roots ready for planting. Once planted, the roots resume growing, and soon, foliage and flowers will follow. Open the box and check the plants once they arrive. The roots and packing material, whether it is sphagnum moss or wood shavings, should be moist. A small amount of mold on the roots is acceptable. Remove the packing material from around the plants and dispose of it. Trim off any damaged roots as well as any that are much longer than the others. Use sharp pruning or gardening shears. Fill a bucket with warm water. Set the roots inside to soak. Place the bucket in the shade while preparing the planting area. Plant lavender in sandy soil. Mix sand into the soil to raise the bed level 1 inch to improve drainage. Dig holes to the same depth as the root. Dig deep enough that the crown of the plant—where the stems come out of the root—sits at or just below the soil surface. Make a small cone of soil on the bottom of the hole. Spread the roots around the cone. Fill in the dirt around the lavender root. Water the lavender thoroughly, then place a mulch of sand or small pebbles around the base of the plant. Allow the soil to dry between watering. Lavender is drought resistant. Water only during extensive dry spells after the first year. Soaking once a week is preferable to frequent watering. 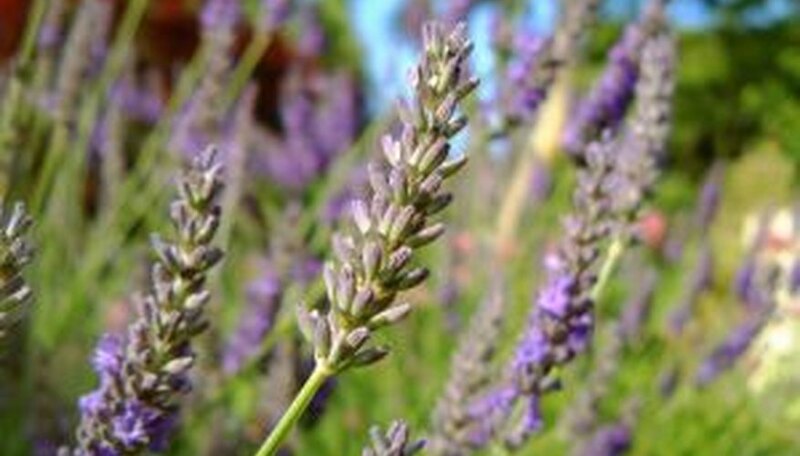 Plant lavender in areas of the garden where deer are prone to destroying, as they avoid lavender. Too much moisture causes lavender roots to rot. Ensure the area is well drained and away from water runoff.